Description: The SAP Group Nurseries are among the Top 10 European Nurseries. The site totals 310 acres of production including 1,000,000 field grown trees and containerized production of 900,000 potted plants. In addition, the Group has a 10,000 unit Airpot tree production facility. 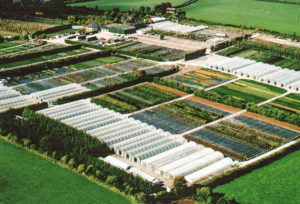 Sap Nurseries has the largest range of Irish grown trees in Ireland with as many as 296 varieties available for sale in as many as 15 different size groups. We have specialised in Garden wholesale for over 40 years and are recognised as having the highest quality and fastest delivery times in the marketplace today. In addition to our tree range, SAP also grows an extensive range of Herbs, Shrubs, Hedging, Grasses and Herbaceous plants. SAP Landscapes is the largest Landscape and Ground Maintenance Contractor in Ireland. Our growth and success is always fuelled and underpinned by our commitment of delivering Customer expectations no matter the size of project. This slavish commitment to service delivery is verified by SAP’s unrivalled awards history issued by both the Association of Landscape Contractors of Ireland and Bord Bia. SAP prides itself on being able to bring its Technical Expertise and Project Management skills to a broad range of Landscaping projects for our clients. SAP experienced staff will provide a design and build service tailored to your budget. Our commitment is to the delivery of your project on time and within budget without ever compromising on the quality of the finished landscape.